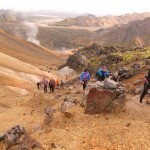 For many runners the Laugavegur Ultra Marathon is the most enjoyable race in Iceland. The course takes runners through areas of outstanding natural beauty at the same time as being a challenging course. Hikers normally cover this distance in four days. 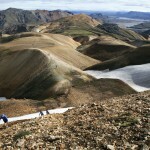 The course is multi-terrain; sand, gravel, grass, snow, ice, rivers and streams. Competitors must be in a very good physical shape to take part in this 55 km Ultra Marathon which under no circumstances is suitable for beginners. For those who are taking part in this marathon for the first time we recommend ultra marathon training on trails and hills and the steeper the better! The route has demanding hills that most runners walk up so it is also necessary to practice power walking.